Who doesn't love a cheeseburger? This past fall, we were on the road every weekend. Atlanta, Jackson, Nashville, Little Rock, Austin, just to name a few towns. My rule when traveling is no chain food. The exception is an Egg McMuffin once in awhile, but I even resist coffee chains. We love to find that out of the way cafe, the trendy new spot or an old local hangout. This past weekend we got up the day after Halloween, and I had a little red wine headache. A five mile walk helped, but I was famished, and our hotel was by a Fuddruckers. Now I haven't been to one in well over 15 years, but I needed a burger. Needless to say, I was not disappointed. Pretzel bun, guacamole, crispy on the edges, tender and lean. When we got home, I had burger on the mind. 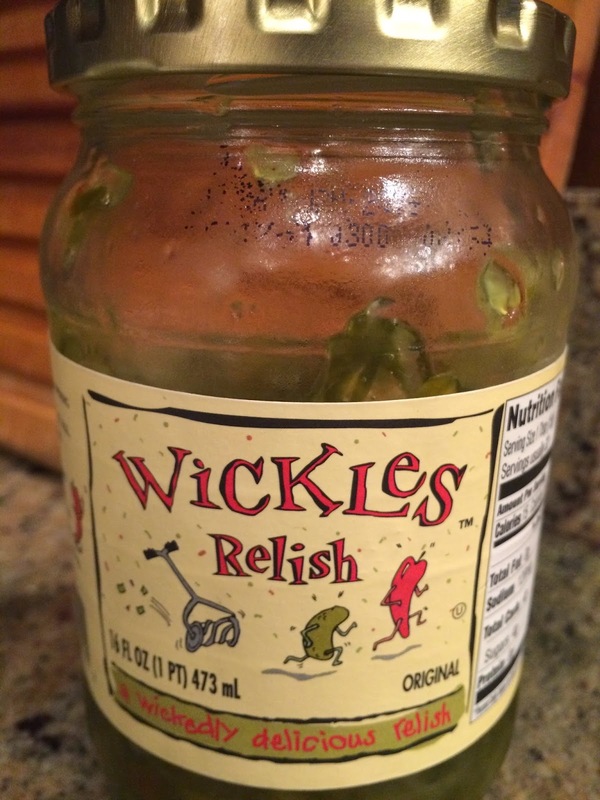 I don't like dill relish or sweet relish, but I LOVE Wickles Relish! 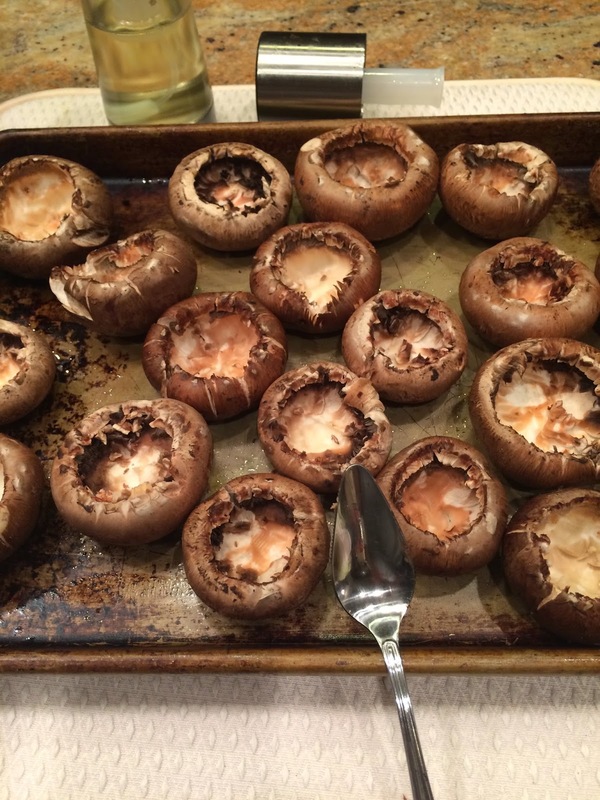 As I was contemplating dinner, I had portobello mushrooms, the smaller ones, and I usually stuff them with crab. But it is gloomy and the cold rain is coming in, I wanted comfort food. I decided to invent a little burger riff of my own. I just threw this together, and I like the idea of all the variables. Ground beef, ground turkey, bison? Sweet relish or dill, Dijon mustard or yellow, ketchup, chili sauce even Siracha. I used cheddar, but I know Mr. Preppy would rather have government cheese, the bright yellow American slices wrapped in plastic. But what about blue cheese or swiss? So many possibilities. 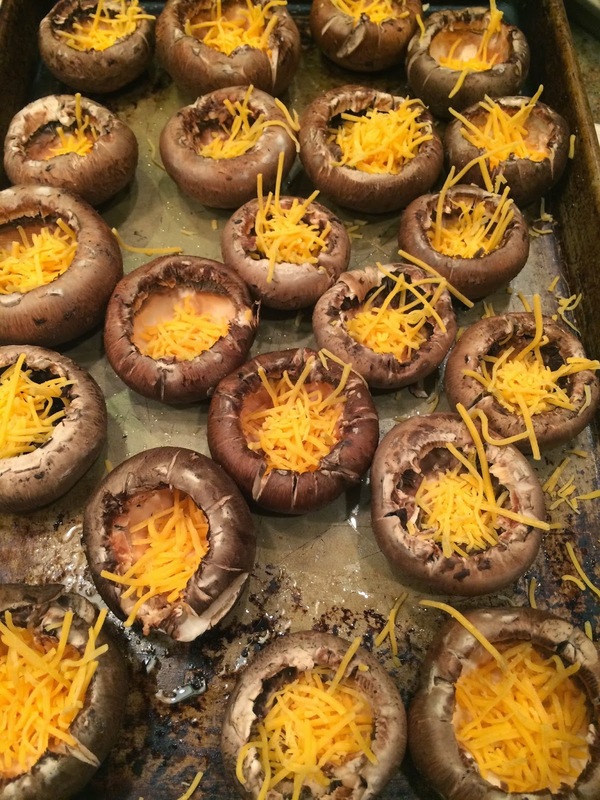 The mushroom cap is a great vehicle for flavor. Here's how mine went. Cook up the bacon until crisp. Drain and cool and then crumble. Set aside. Drain the grease from the pan and saute the onions until browned on the edges, and add the ground turkey. Cook over medium heat until no longer pink, separate into fine crumbles with a spatula. Add the ketchup, mustard, relish and mix well. Turn heat to low and salt and pepper if needed. Meanwhile, clean the stems and ribs from the mushrooms. A grapefruit spoon does a good job. Sprinkle a little cheddar in the bottom of the caps, and then fill with the ground turkey mixture. 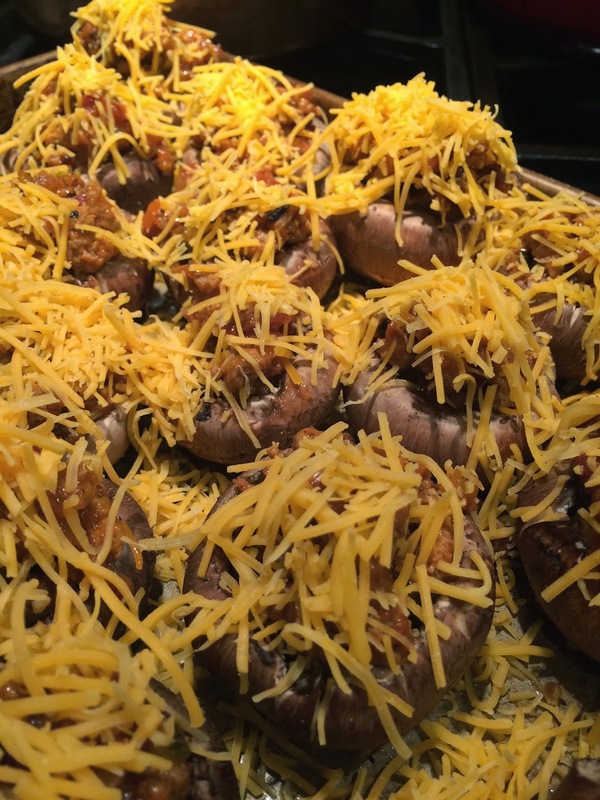 Sprinkle with more cheese and bake at 400 for about 10 minutes. My grapefruit spoon has a serrated edge which is good for cleaning lots of things! A lot of cheese on top of the meat mixture! Everything a burger has to offer, only bite size and no bun! I served a few up with a little wedge of avocado, Mr. Preppy put a little squirt of ketchup on his. I think a little dab of cili sauce before baking, ala 1970's meatloaf. would be good too! So, what are you waiting for? Get in there and cook!!! Yum! We miss this original pizza here in the South, so we make it at home!!! 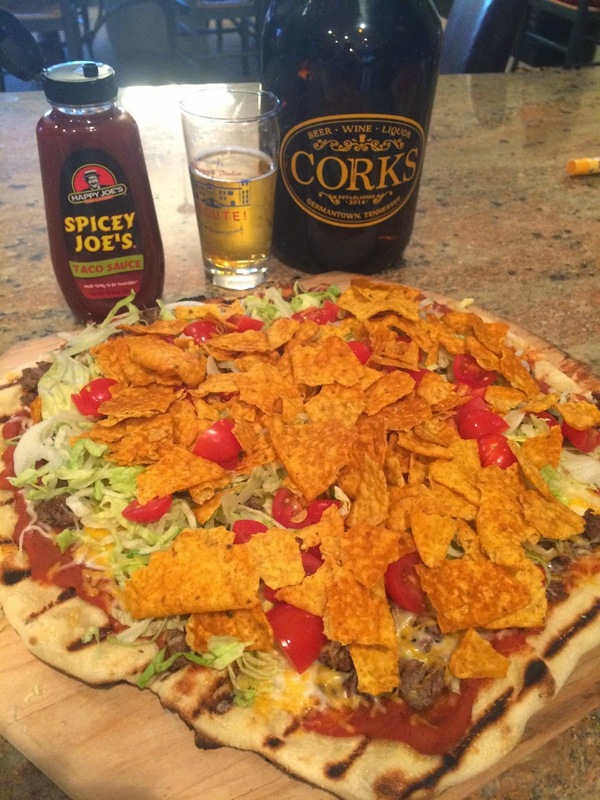 I wrote a few years back a blog on Happy Joe's Taco Pizza. I took a lot of Midwesterners, especially the ones who have moved away, down memory lane. 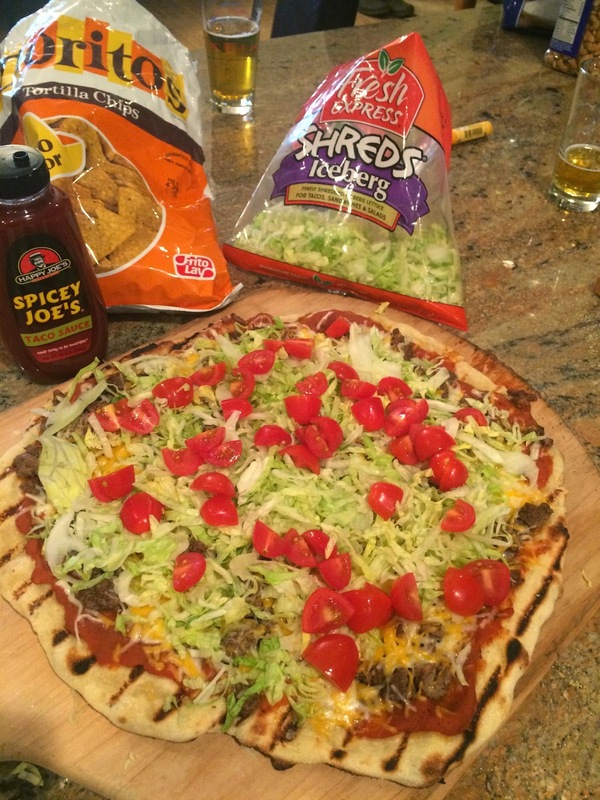 I love all the comments, and it is obvious we all pine for our Taco Pizza. If you have never been to a Happy Joes, well, you just wouldn't understand. This is a special pizza. Please don't put salsa or guacamole on it, no jalapenos or chorizo. This is sacred ground for a kid from the Quad Cities! The first blog was 4 years ago, and still one of my most popular. However, in that 4 years, Mr. Frito Lay decided to quit selling Taco Doritos in the South. How dare him! After doing a little research, I found out they are sold in the Midwest, and I beg everyone coming to visit to bring me some. 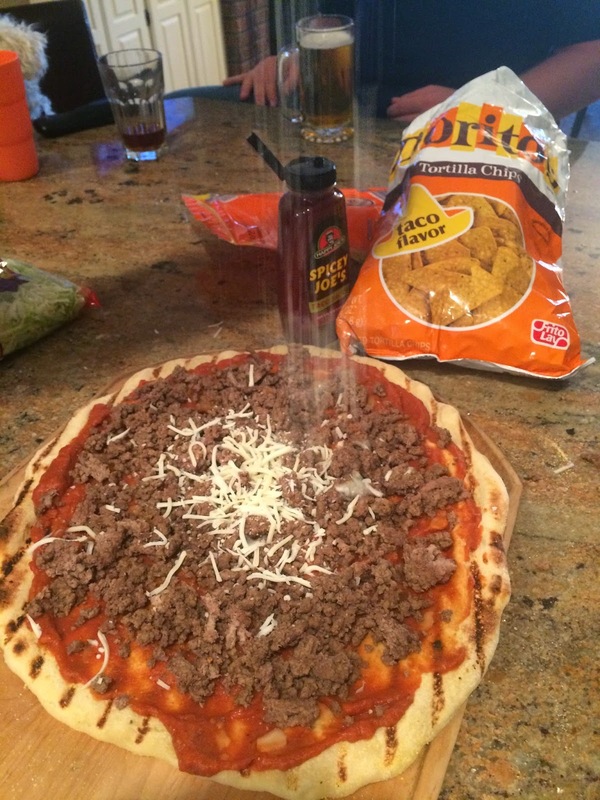 Last week my sweet son brought me 2 bags and we were all so happy, as it means just one thing...Taco Pizza! And since winter doesn't mean snow here, we decided to take this outdoors. Grilled pizzas are our favorite! Before we get into the recipe, lets talk grilled pizza in general. We have done this for big parties, and although it can be a lot of work, everyone loves the do it yourself aspect. I buy lots of dough and divide it in small portions for individual pizzas. I use my peels, but also flat cookie sheets, and have a long row of toppings available. Scott is usually parked at the grill, but as long as he has a little company and a cold beer, he enjoys this! It takes a little mission control to keep things moving, but I pass out a peel with a crust and send them out, they wait as it's grilled, and then come back in to top it and out again to finish. When they bring their finished pizza in, we cut it on the peel and slide to its plate and put another crust on for another guest. We did about 50 one New Year's Eve. Needless to say everyone loved it! 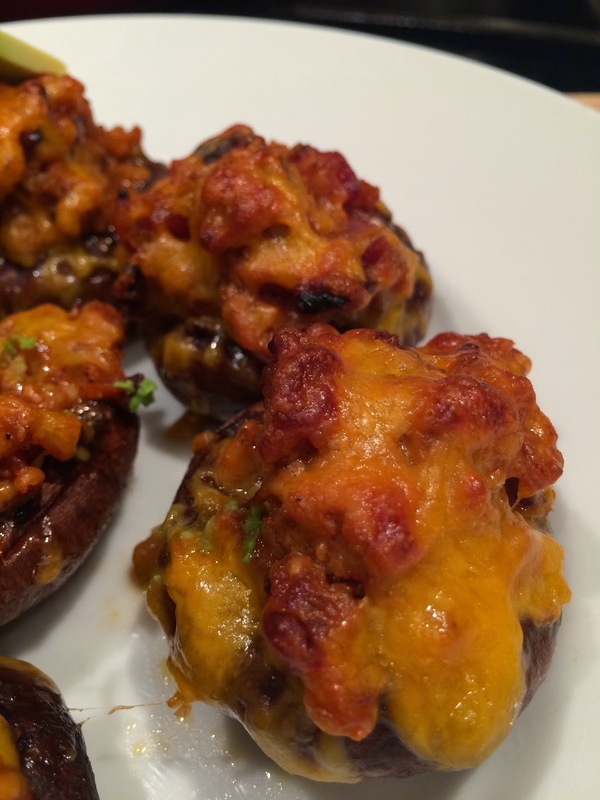 The last time I blogged this, I had been using a frozen dough from the market. It was fine, but not great, and certainly not as good as my homemade. I have a great NY style pizza place up the street that is happy to sell me dough. This is the best thing ever. I can do grilled pizzas at the last minute! When I get the dough, I stretch it out onto a pizza peel with a little cornmeal under it, and let it rest for about 5 minutes. Then restretch and get to work. Brown your meat first, it is best to have it cooled, but not cold, direct from fridge. I use ground beef, ground Bison, ground turkey, whatever you decide. I believe once you sprinkle in that packet of seasoning, you can't tell what it was! I sometimes use just half a packet, I think that seasoning is terrible salty. Drain if your meat is fatty and set aside or chill if made ahead. Preheat your grill. Medium high is good. This takes a little practice. On our gas grill we keep the top and bottom burners on Med high and the center burner on medium. On the Green Egg (which is far superior when it comes to taste), you have to work with the charcoal and the vent to keep the heat consistent. But the flavor from hardwood is amazing! Just takes a little extra time to get those coals hot and white. If you made your meat ahead and put it in fridge, let it come to room temp. Set aside. Get all the toppings ready. Cheese shredded, lettuce shredded (or bag opened! ), and Doritos smooshed. The crust on right is ready to grill, the one on the left has been grilled on one side, that is where the toppings go! Your crust should be ready to go on your pizza peel. Hopefully you have enough corn meal under it so it will slide off nicely... You will want a grill spatula handy to help maneuver on the grill. 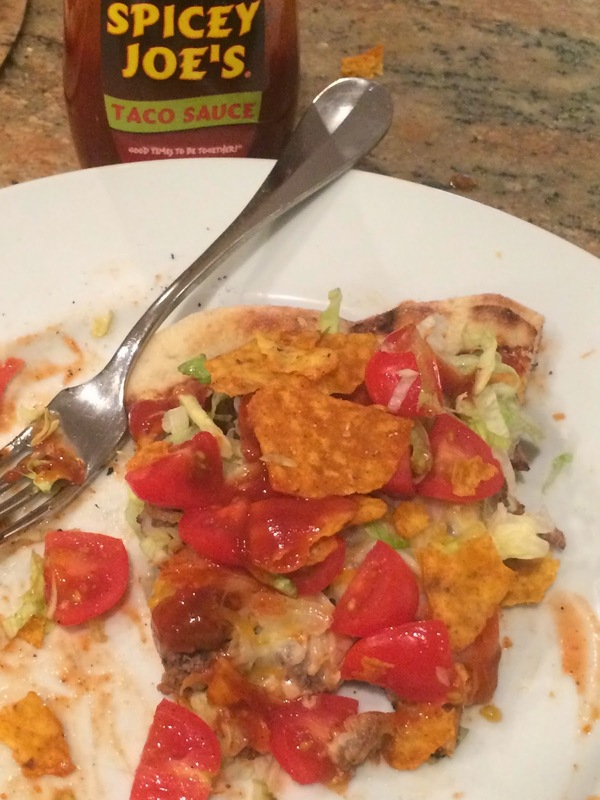 Mix taco sauce, beans and pizza sauce together. How much? Well, I used a can of beans and 1 cup pizza sauce. I have also added taco sauce to it, but it isn't necessary. You can alter it to your own taste. I put this in a small saucepan and heat gently. Refried beans get a little more pliable as they are heated, it will spread better if it's warm. A sprinkling of cheese over the meat. Cheddar, Colby, Jack, Mozzarella...we use all kinds. Now, wipe your grill grids generously with olive oil on a paper towel, and very carefully slide the pizza (there is nothing on it yet!) onto the grill. BEWARE, once that dough hits the grids, it will adhere, so there is no moving it once it is on!!! But as it cooks, it releases, so don't freak out. And a wonky shaped pizza tastes just as good as a perfectly round one. We never have round pizza. Close the lid and peek often. It takes just a minute or 3, and the top will bubble a bit and dry, peek under, you don't want it scorched. Carefully remove the pizza crust from the grill. 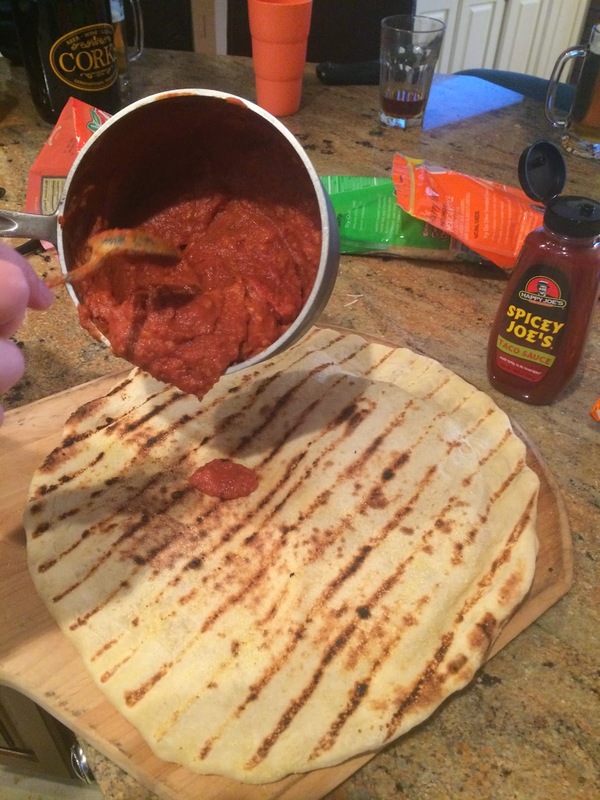 We use an enormous spatula and flip it onto your pizza peel, so the grilled side is up. Got that? Grilled side up. The "raw" side is down, but it will dry out on the grill so sticking will not be an issue. But you want that cornmeal on the peel so it does slide a little. Generously spread your bean/pizza sauce on the crust. Then top with the meat and cheese. Back to the grill it goes. You can turn the heat down a little here, you want that "raw" crust to cook, but not so fast that the cheese doesn't melt. 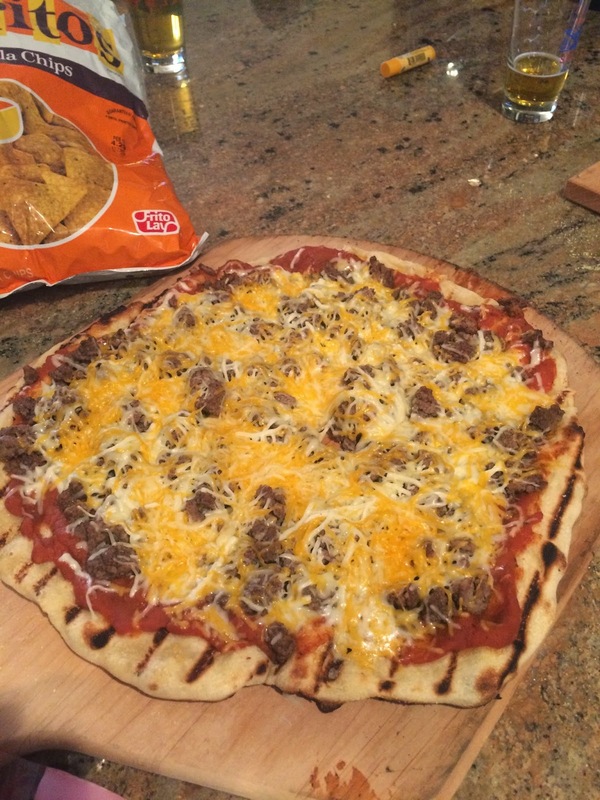 When the cheese has melted over that taco meat slide it back on your pizza peel. This cheese could have been further melted, but if the grill is too hot the bottom of the pizza gets over-charred! Let it rest for a minute and cut with a pizza cutter, maintaining the shape, and then top with shredded lettuce, tomatoes, and the Taco Doritos. You can cut it after you top, it's just messy! 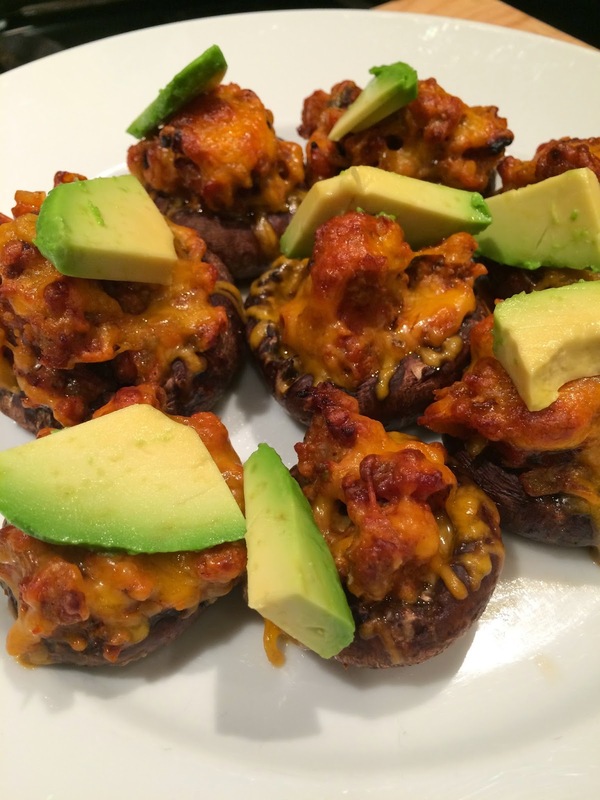 Serve with taco sauce and beer!! So what are you waiting for? Get out there and grill!!! A squirt of sauce, and the pizza disappears!!! 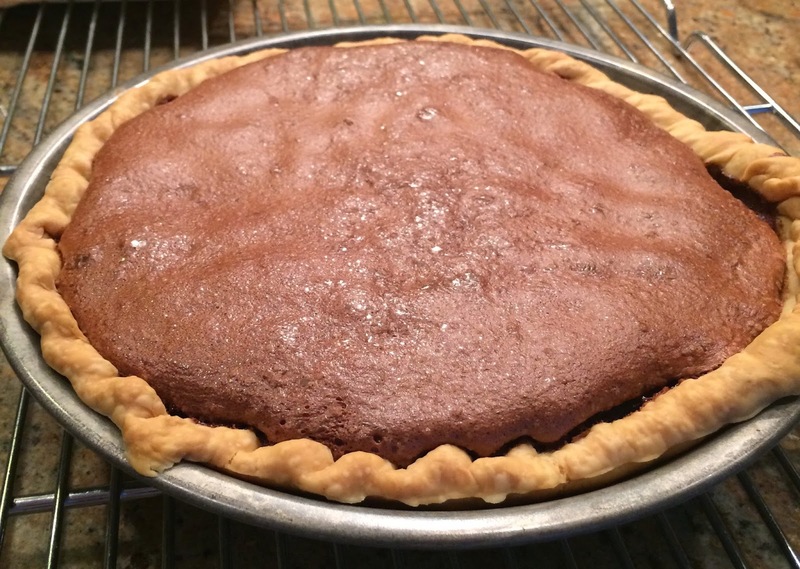 My earlier post on Minnie's Pie is one my most popular. 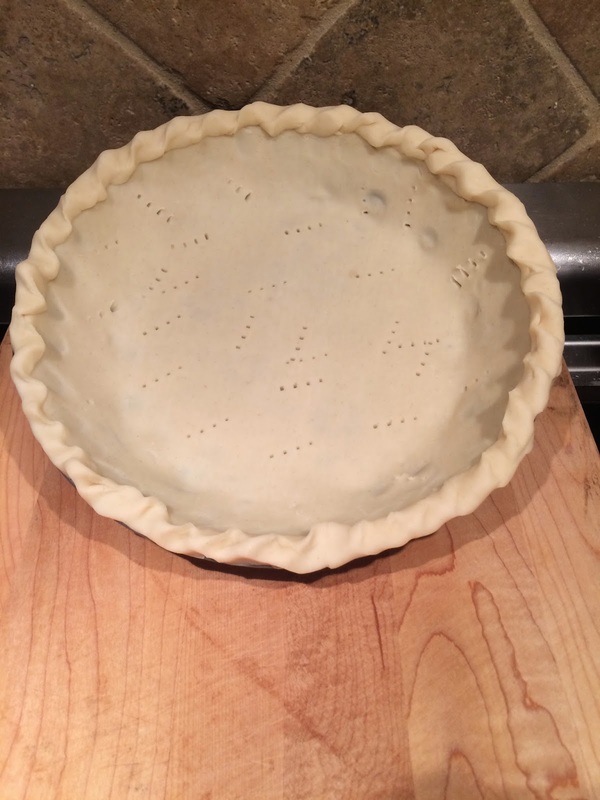 However, the comments were getting concerning, people were having pie failure. I had out of town company, and decided this was the perfect time to pull Minnie back out and bake a great Southern dessert for my friends from the NorthWest. As you may know, should know, Minnie was a maid in the movie The Help. Her cooking is a big deal in this movie, and her pie has a secret ingredient (that I leave out!). I reread the comments and remade the pie, and it was perfect. I didn't change a thing. However, the mixing part is imperative. It says 3 minutes. Time it, it is way longer than you think. Use the best you can get! 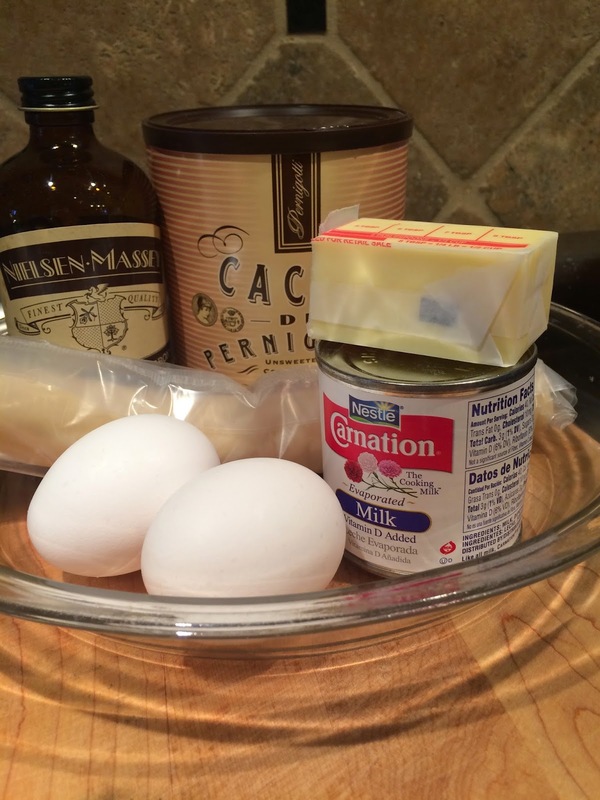 Use that hand mixer, and a timer! I, again, used a Pillsbury crust. I love a homemade crust, but this is easy, and for last minute, it really can't be beat. I did kind of a crummy job crimping the edge so I have a wonky side, but worked out fine! Finally, check the size of your pie pan. Too big, your pie will be thinner, that's a problem when it comes to baking time. 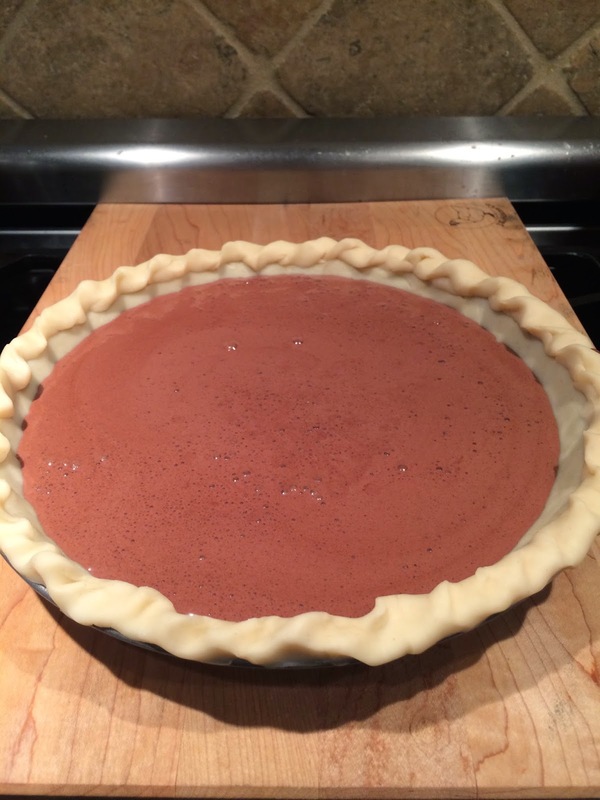 I just can't emphasize how dang easy this pie is! Fit crust into 9" pie pan. Crimp edges and prick bottom and sides. Preheat oven to 350°. 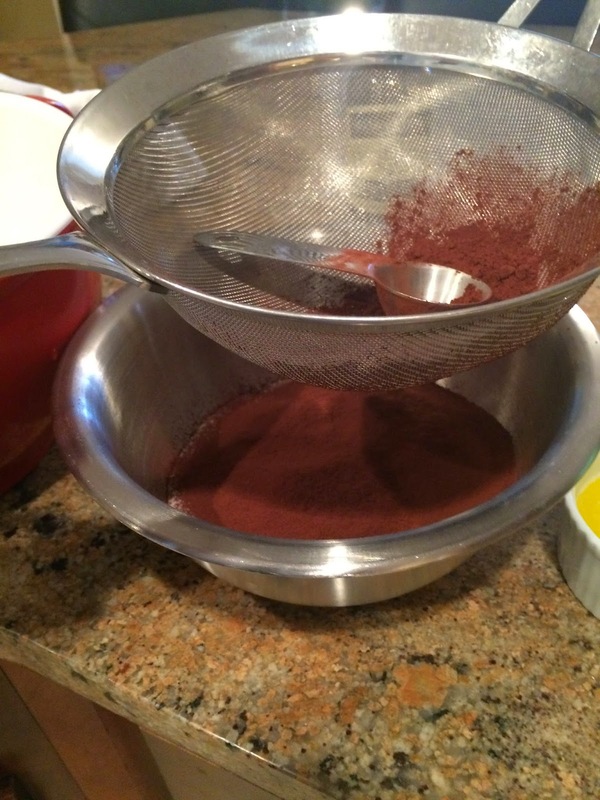 Mix sugar, cocoa and butter in a mixing bowl. Add eggs and beat with a mixer 3 minutes. 3 whole minutes...time it. Add salt, milk and vanilla and mix well. I used the hand mixer, just to incorporate it all. Pour filling into shell and bake for 35-45 minutes or until edges are brown and filling is slightly set in the middle. It should wiggle a little. Cool completely before serving. Can be refrigerated or served at room temp. And tastes even better with fresh whipped cream! So, what are you waiting for? Get in there and bake! It firms up when chilled, ours was a touch warm, and delicious! I have been baking a fair amount of cookies, sometimes I shoo them out so fast I forget to snap a photo! So here's a quick rundown of a few cookies I made recently! 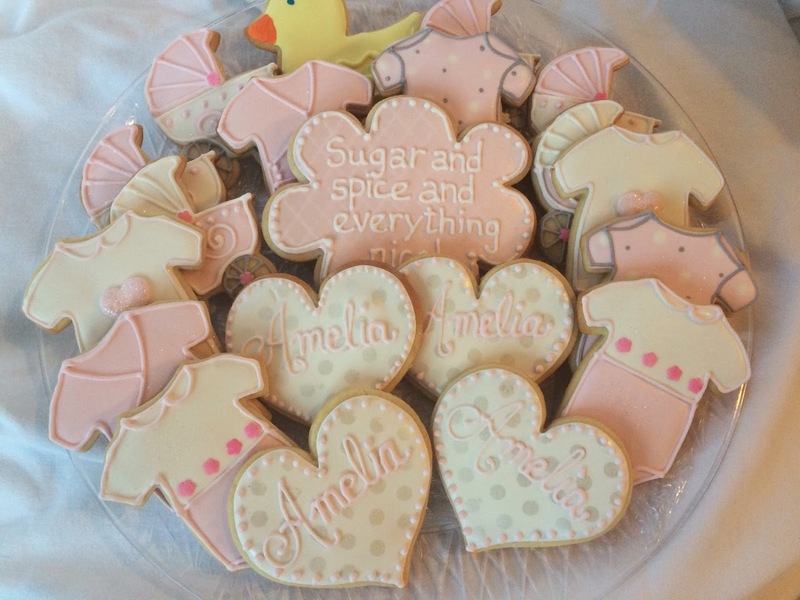 Baby shower cookies are some of my favorites! Soft colors....everyone is so excited! 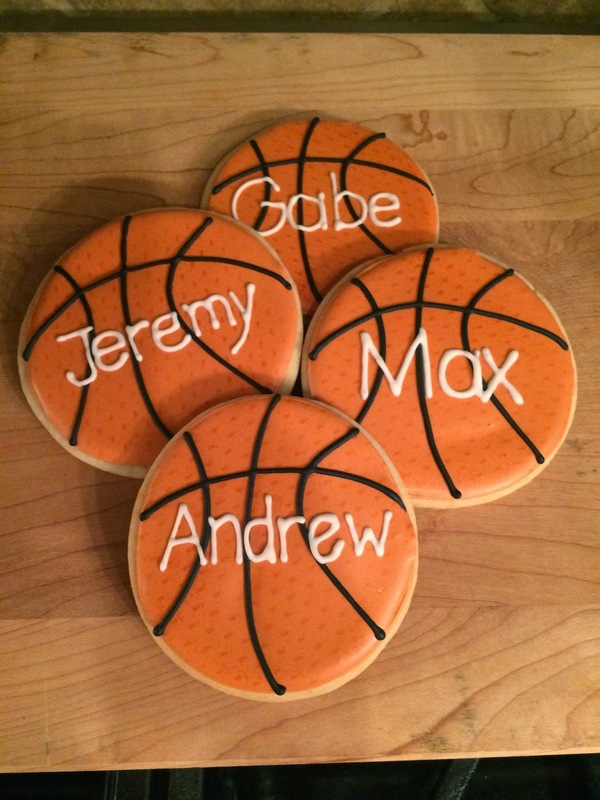 Then I made these basketball cookies for a friend. I really wanted a little texture, and found this post by Sweet Sugar Belle, and she showed her cute basketball cookies she airbrushed with netting. I hunted all over this house for netting to no avail. So I called Christina, off at college, and explained my dilemma. She reminded me of some hideous tank top I bought her that was...mesh. So I chopped it up (while I had a minor panic attack in her closet full of clothes), and it worked out pretty well. 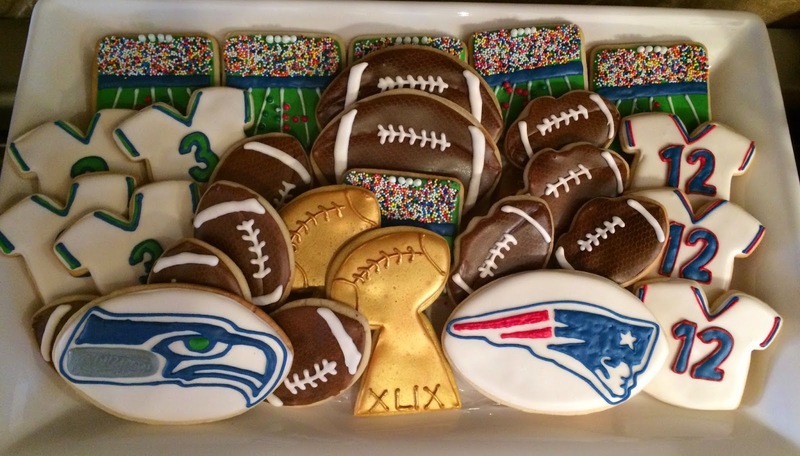 Finally I made SuperBowl cookies. 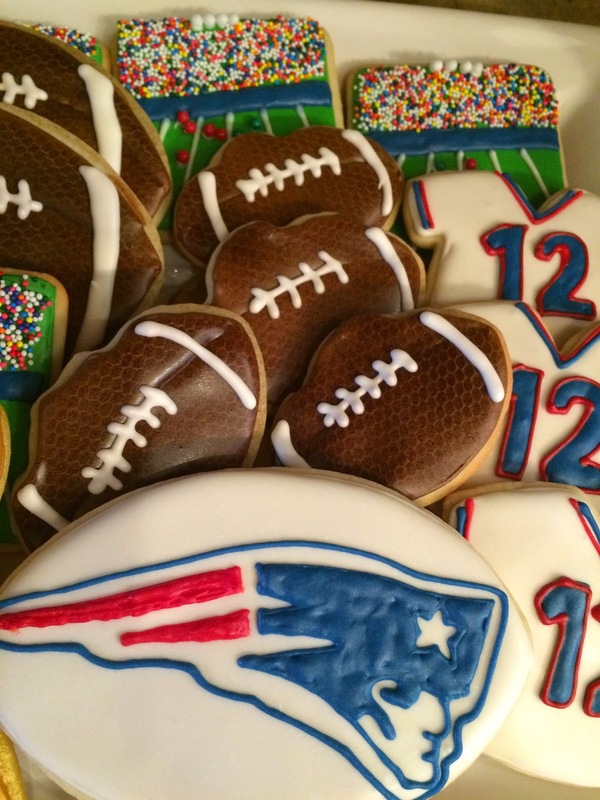 I borrowed the best idea ever from my cookie friend Baked By Rachel , the deflated footballs! Then I did get my hands on netting and tried the airbrush thing again, and gave the footballs some texture. Worked out well. So back to the ovens....lots of dough to roll!! !